For more information on the Samsung Galaxy Studios, check out this page on Upcyclethat.com. Samsung is getting into the container architecture at the 2014 Winter Games in Sochi. They had their Galaxy Studios, a pavillion to showcase their products, built with a wall made out of containers. They also encorporated glass to allow natural light into the building. For more pictures and the full story, please click here for the coverage from Upcyclethat.com. After the pavillion is no longer needed in Sochi, the containers will be disassembled and be used by an educational facility in Russia. Samsung also has built a 21-student, solar-powered school outside of Johannesburg, South Africa. According to Stuff.co.nz, storage containers have been used in the “Restart the Heart” program to reopen retail shops destroyed in the city’s earthquake. 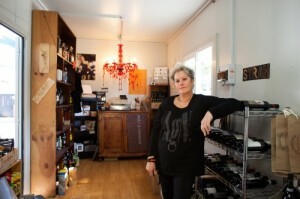 Containers were used for various retail shops, including clothing, a wine store, a café and bar. containers have been used to prop up buildings, including the cathedral and for various offices, homes, etc. Also, a group is creating art on and over containers, seeing them at a large canvas new to the city. For more information, check out the coverage from Stuff and 3 News.